If it isn’t your favorite verse from the Old Testament, it probably ranks in the top ten. Its Jeremiah 33:3. Even the reference is easy to remember. I’ve heard it quoted in personal testimonies. Casual conversations. With first time acquaintances. At funerals and weddings. But looking at the context makes the verse even more meaningful. Where was Jeremiah when he wrote this verse? What was his life like? The contemporary translation, The Message makes it pretty clear. 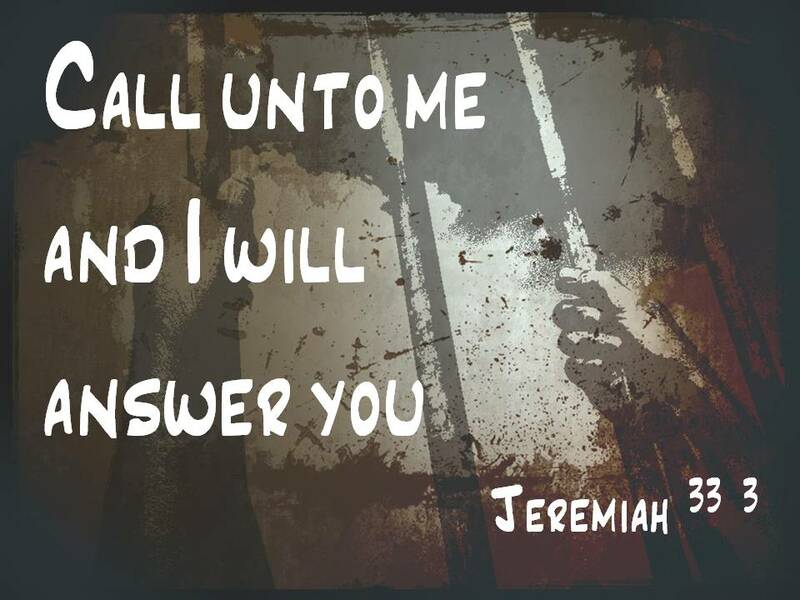 Jeremiah was still locked up in jail, a second Message from God was given to him: “This is God’s Message, the God who made earth, made it livable and lasting, known everywhere as God: ‘Call to me and I will answer you. I’ll tell you marvelous and wondrous things that you could never figure out on your own’ (Jer. 33:1-3). Not only was the prophet in jail, but he was still in jail. Inferring he’d been there for a while. If you look back to chapter 32 you’ll find the cause of his jail term: He’d given a message the king didn’t like very much, and the result for Jeremiah was to do some jail time (Jer. 32:1-5). Are you kidding me? Imprisoned for doing the right things? And another favorite verse is close to that setting. . . Jeremiah 29:11. For I know the plans I have for you, declares the Lord, plans for welfare and not for evil, to give you a future and a hope (Jer. 29:11). It was in the setting of injustice that God gave Jeremiah verses of hope. And he offers that same hope to each of us today. So does your life have some injustices? Were you mistreated by an authority? Misinterpreted by a friend? Do you feel trapped in your present situation? Does it seem like you are still in the same situation you’ve always been in? Sounds like a good time to call to the Lord and he will answer you. He’s wanting to show you great and mighty things that you did not know.